She had an interest in Lucha Libre, because her father was a luchador, but the day she decided to train in this sport was when her father brought her to a wrestling event at Arena Mexico. On that day there was a women's match in which participated women wrestlers from the United States. There was one in particular who was wearing a gear with stars and stripes just like the United States flag. She was impressed by those foreign wrestlers and considered them as her inspiration. She asked her father where she could train. However, her father did not give a clear response. He only said to her later again and again. Until one day she told him that she would find a trainer by herself. What Chico Malo did was bring her to the gymnasium of Villano I. Chico Malo instructed Villano I to be stiff with his daughter, so she would stop asking to train. Even with the first hard day of training with Villano I, she persevered. Villano I trained her in her physical condition. Then she trained with Tritoncito, Último Guerrero and Gran Apache. Her debut was not actually a match in which she was programmed. On or about 1999 there was a wrestling event in Puebla, and one of the luchadoras had another commitment and could show up. However, that luchadora left her baggage with her gear. There was no one else available to take that place. She was chosen to replace that luchadora. She donned the luchadora's mask and gear and was introduced by the name of Princesa Escarlata. She went with La Rebelde against Princesa Zareth & La Gata. After her debut went under the name of Chica Mala she took that name after her father. 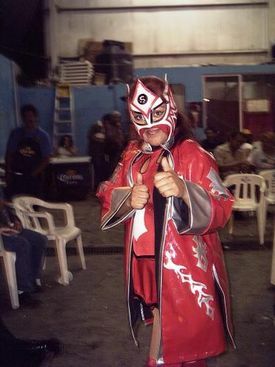 During the time she met Octagoncito she changed her gimmick once more. La Parkita gave her the name of Lady Sensación. She had wrestled in almost all the Arenas of Mexico. Worked independently with promotions such as CMLL and AAA. Also wrestled in the United States in different cities. Appeared in Arena Coliseo for a documentary, tv commercials, and received recognitions with artists.